Phelan, Phelan & Danek, LLP has assembled a team of lawyers that provide representation and services covering a broad spectrum of legal disciplines and practice areas. This gives our firm a keen ability to evaluate all available options to achieve your goals in an efficient manner. Phelan, Phelan & Danek, LLP meets clients’ needs by finding innovative solutions. Phelan, Phelan & Danek, LLP will present you with all available options to ensure that your objectives can be met efficiently. In addition to vast trial experience, the firm is well versed in alternative dispute resolution including mediation and arbitration. Jack Phelan, Esq., is a certified Construction Arbitrator with the American Arbitration Association. Whether it’s a traditional settlement, mediation, or arbitration, the team at Phelan, Phelan & Danek, LLP will exhaust all available alternatives to achieve the best possible result. When alternatives fail, the trial lawyers of Phelan, Phelan & Danek, LLP have the skill and experience necessary to successfully represent their clients at trial. When it comes to guiding clients through the rigors of litigation, few firms match the skill and track record of Phelan, Phelan & Danek, LLP. The trial lawyers at Phelan, Phelan & Danek, LLP have several hundred jury verdicts to their credit. In addition, the attorneys at Phelan, Phelan & Danek, LLP have vast experience before various administrative tribunals in the State of New York including the Department of Education and the Office of Professional Medical Conduct. 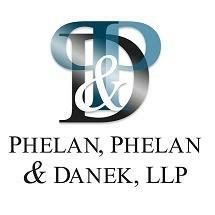 Phelan, Phelan & Danek, LLP is at the forefront in new developments in the law. The firm’s appellate department has a history of success before the highest courts of New York, including the State’s highest court, the Court of Appeals, the Second Circuit Court of Appeals, and various departments of the Supreme Court, Appellate Division. The professional expertise of the members of the legal team at Phelan, Phelan & Danek, LLP has been recognized by various organizations both in and out of the legal profession. The attorneys at Phelan, Phelan & Danek, LLP frequently lecture on behalf of various groups and organizations such as Vassar Brothers Medical Center, Albany Medical College, the Defense Research Institute (DRI), and the New York State Bar Association.